SEEK THE BEAUTYAfter an intensive fashion month, I’ve decided to summarize everything up in this Instagoodies post with some of my favourite pictures! Honestly, being able to travel so much in such a short amount of time was intense but so much fun. I am so happy to have my phone and camera always with me to document all this, I am sure all these things are going to be so fun to remember in a couple of years. We’ve lived some amazing experience and met so many cool people, which I think is definitely the best part out of all this. Also I got the chance to meet some of you guys outside the shows, which were also such memorable moments! As you know, social media has always been super important for me and directly linked with the content here on Kayture. Instagram (@kristina_bazan or if you want to follow my partner in crime @jameschardon) has for sure become like my second life diary and it’s so much fun to go on the quest of the perfect picture. Like the one above : it’s indeed a shot that I’ve taked with my Iphone, and not even the last one as I still have the 4S. And guess what, it’s become one of my all time favourite shot as it reminds me of this golden light on a parisian afternoon. It’s incredible how a spontaneous moment, captured on film, or phone can be so impactfull and beautiful as it is. Of course, then you can set things up a little but I love how Instagram gets me a little creative everyday of my life and pushes me to seek for inspiring elements all around me on a constant basis! So hold on for a second, and look around. Spot the beauty around you and take a picture! Have a lovely week-end guys x. 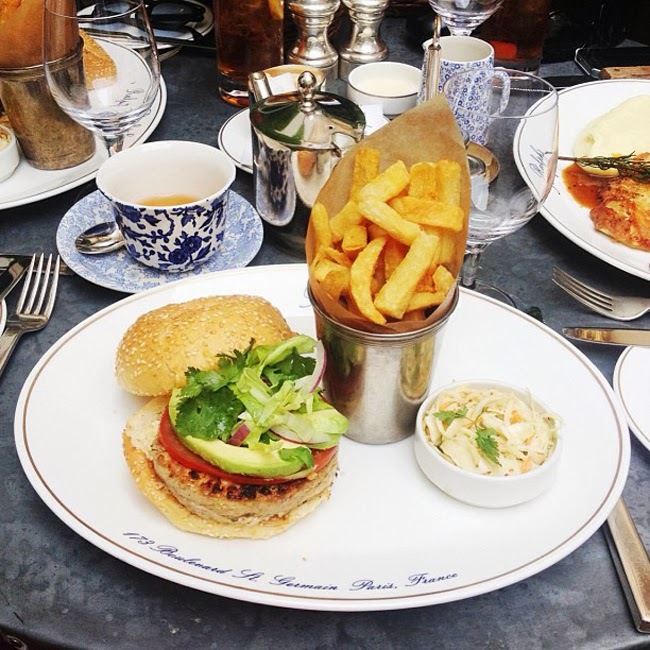 One of my favourite restaurants in Paris, Ralph Lauren’s famous ”Ralph’s” which has the most adorable little interior garden and interior itself : imagine dark wood, old school paintings and the best traditional menu ever with… wait for it… delicious burgers. You can even go for a chicked steak, tuna steak or beef if you like it classic. I personally always go with the chicked and absolutely love it. And the best part is that at the end of the meal you get caramel popcorn with your coffee, yum! A great way to indulge after a super strict fashion month. Had a great night with these girls, Eleonora and Veronica, after a lovely dinner at Kong in Paris. Italians are the best!! The traditional trouristical stop at the Trocadéro for a little fun! And to get that Instagram-worthy shot of course, d’uh. 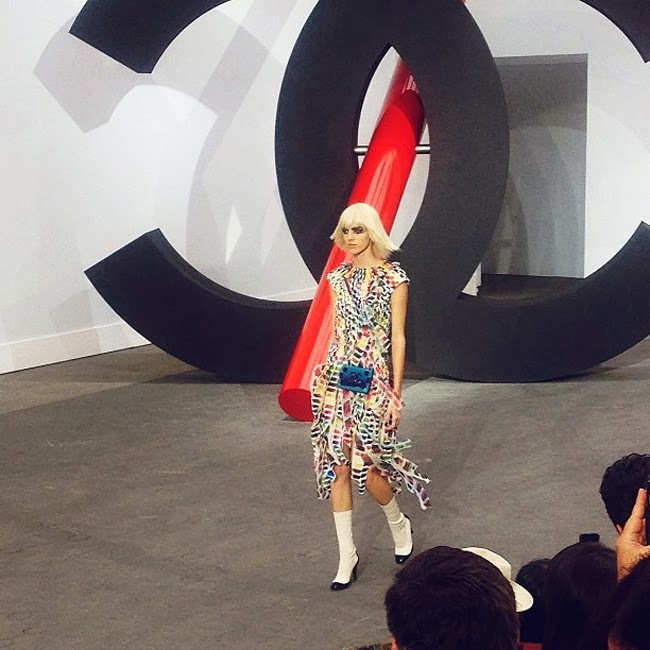 The Chanel SS14 show was super colourfull with amazing artsy inspiration behind. The materials were flowy and very fresh, I would definitely see myself wearing these amazing prints. It was my first time attending a Chanel show, so it was definitely a really memorable moment for me, and super exciting one all above. At the ”Beauty In Wonderland” event organized by P&G prestige and Vogue. Super happy to be wearing this amazing dress by Peggy Hartanto. While in Paris, a little stop at Ladurée for lunch is essential! 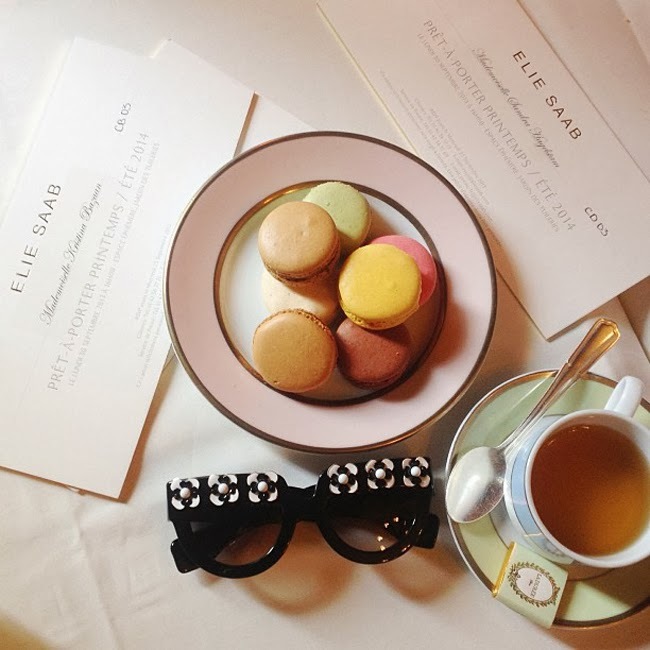 And these macarons with tea were the perfect way to cool down in the middle of a super busy fashion week day. 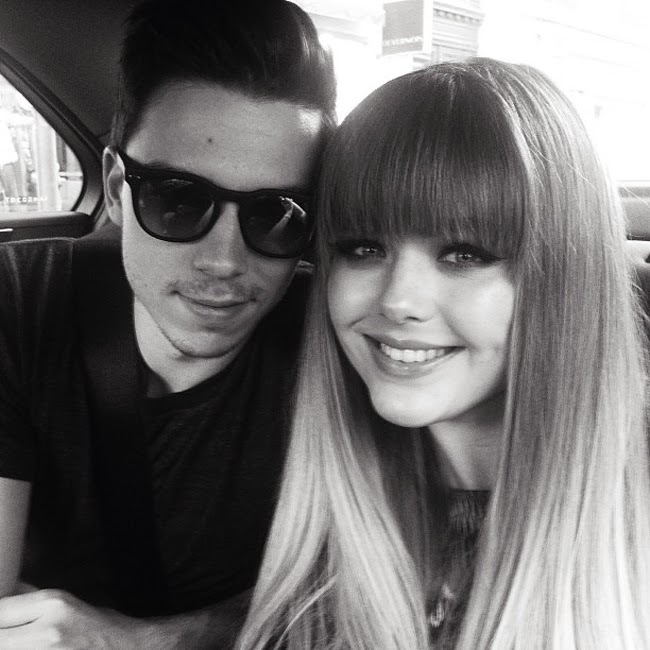 Found this picture of my love and I at the Louis Vuitton event in Paris. Such amazing memories from this month that I’ll always remember. I have the best man ever!! The second look we shot for our new exciting high jewerly project with Louis Vuitton. Thanks to the hotel Fouquet’s Barrière for letting us use this amazing suite, it was the perfect scenenary for the shooting. Little pleasure that James and I shared before Paris fashion week kicked off. Pierre Hermé macarons are even better than Ladurée in my opinion, so de-li-cious. After buying the timeless! So SO excited. Cooling down and being all smiles for some new projects and the end of the fashion month. The third look that we shot for the Open Magazine editorial at the Fouquet’s Barrière, all Dior! At the Bulgari hotel event, wearing this amazing black dress and feeling all chic for a night! 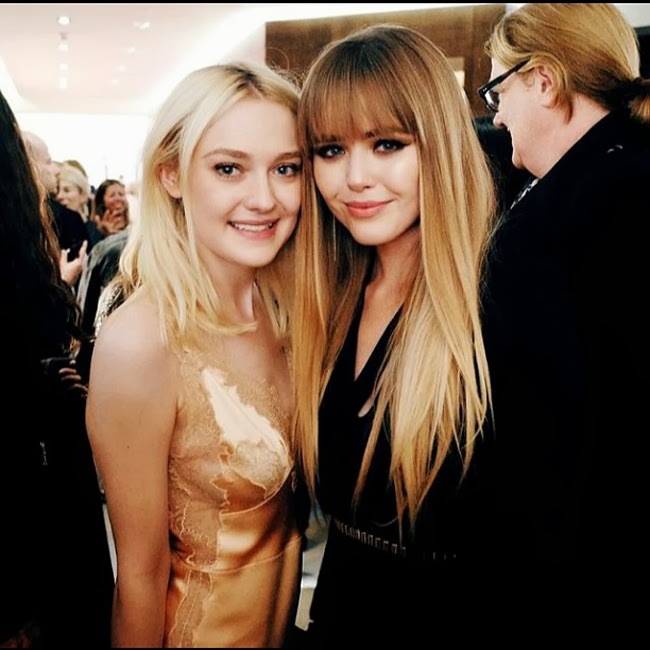 With beauty Dakota Fanning at Louis Vuitton’s Sofia Coppola event. A new home away from home for us! 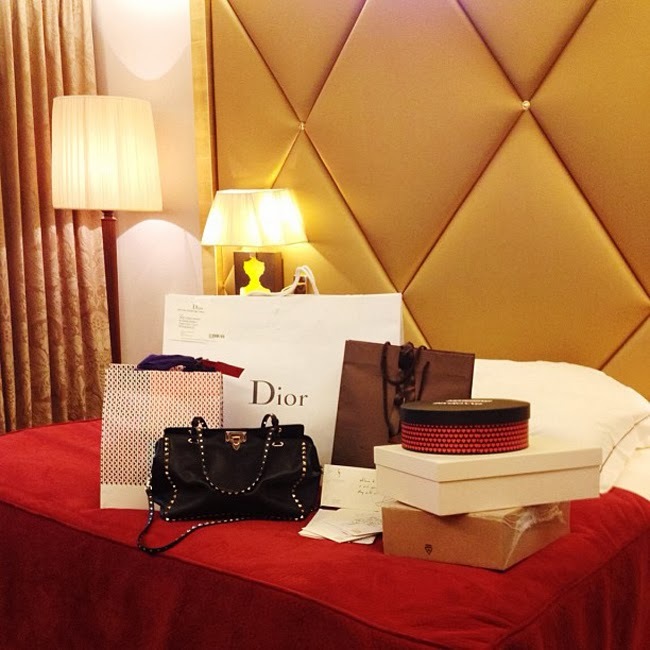 Huge thanks to the hotel Fouquet’s Barrière for welcoming us in one of their wonderfull rooms during Paris Fashion week. Still can’t believe all those gifts! Had so much fun with this little Instagram travel trip! 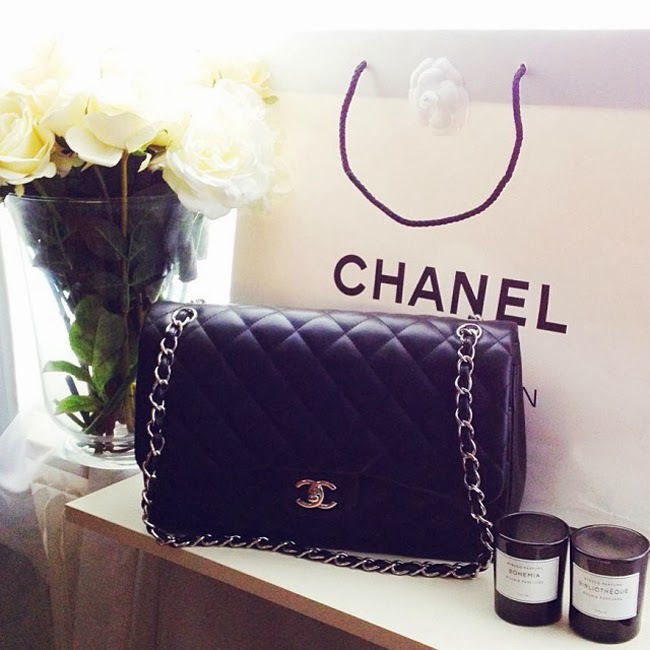 Wow the Chanel bag is a dream indeed! Love your instagram! Always amazing pictures! These pics are so awesome! So fun to see! it looks like an amazing month! To be thin is of great advantage, a lot dresses are all fitable. the dress showed in your post is very hot. Beautiful photo's & post, you are such an inspiration to me! Those Gucci sunglasses look insane! Amazing photos! The first one is a masterpiece! You have chosen my favorite bag ever! 2.55 is the best! Wow Kristina I loveeeed the shot of your jewerly by Louis Vuitton and the shot of the Open Magazing is amaaaaazzzzing! And your look for the Bulgari event was so cool, I love the tone of your hair. 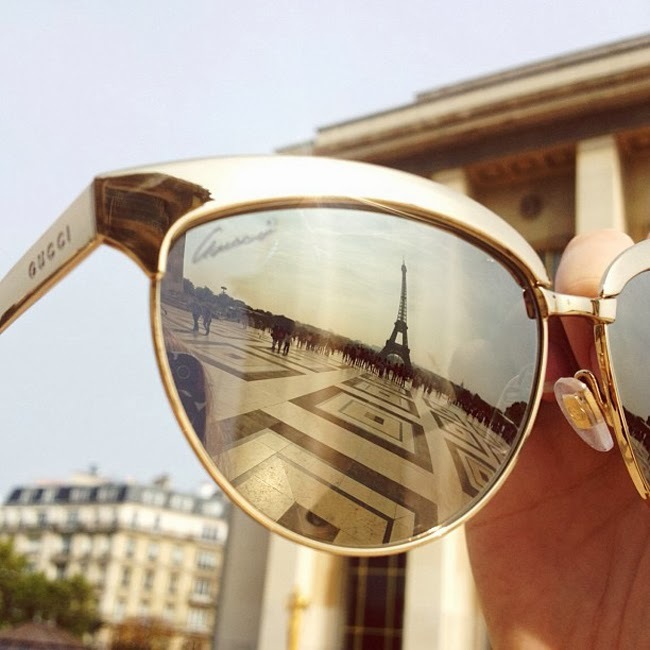 all amazing photos, loved the sunnies from Gucci! I love your photos! Espeacially the first one! Wow, veeeerynice pics and you look still peeerfect. Such a glamorous instagram, so jealous of your chanel bag! It is definitly an incredible evolution of technology that lets us being with you in every moment, in every second of your life, around the world. Isn't amazing we can follow your steps day by day just being in front of our computers? We can be deeply connect with others, knowing their dreams, their adventures just making one click, that's is pure globalization. PD: I just need to know where did you buy that beautiful kinda green top, that you're using in a photo with a black skirt, with those lovely valentino shoes (I think). Wow! amazing life you lead. That last picture is amazing, you're so lucky! Great Instagram shots! I want to be you. You're so.. perfect! Your beautiful face and your perfect taste for clothes! I love instagram. it´s more personal! The 1st shot is lovely....and the last shot is every girl's dream come true! 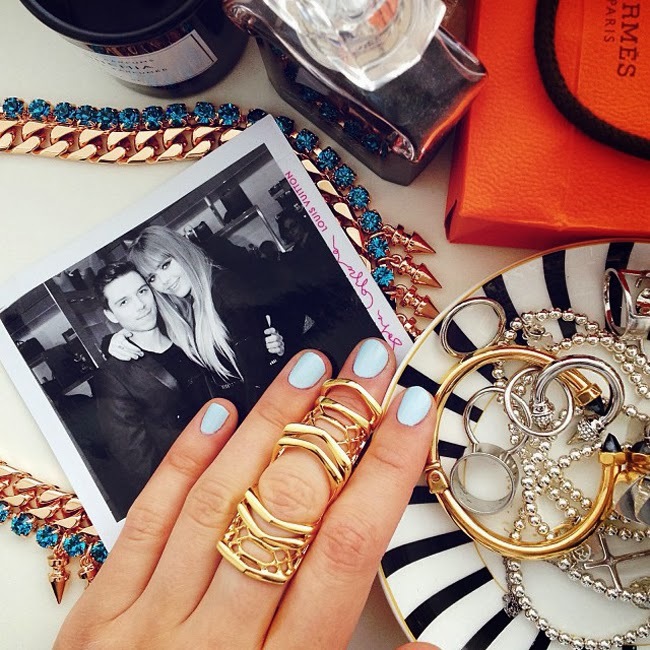 All the photos are so fashionable and memorable at the same time!! Nice job, I'm so happy for you! What a great idea to have a summary in pictures! And totally jealous of your Hermes and Valentino purses! You are my inspiration! Thanks for that! echt tolle insta bilder ! Lovely photos!!! What did you get from Dior??!!?? This might sound weird but i love to wait for your posts, it is actually better when you don't post regularly! (me being really weird, haha) but it makes me want more and get excited for the upcoming pictures and content! And ah, Instagram, adore to follow you there and get curious for what's next and your looks :) Big <3 for Kayture! What a magical life you live... And to share it with your love makes it all the better! All those beautiful pictures, WOW! Those moments will be forever, enjoy! I'm always in love with your insta-pics <3 Seems you had an amazing time in Paris! Lovely pics, love the black dress! You are such a beauty blogger and fashion-lover, I knew it from the way you write this blog and the way you appreciate every little things you have.. I really admire your blog! you're such an inspiring person. I always wanted to start a blog but i don't have the guts haha and besides that the competition there is huge. Whats it like when you attend to some shows or festivals? the fashion industry is quite snobby i think, right? how do you deal with it? I love all your posts, plus the fact that you're representing MANGO.. Check my boutique for your fashion needs: http://lovemyredeemer.tumblr.com/Boutique. Surprisingly, you can find stuffs that people often do not look at, or even overlook to do while submitting a job program. Oh my god. You met Dakota?! That's sooo great! And the Burger at Ralph's looks so delicious!